We were ecstatic to get the call from Alterna Haircare asking for a pair of custom Facebook Tabs. Their haircare products are so fabulous and quickly gaining popularity as the line is now sold in Sephora stores everywhere. The first tab we built was called “What’s New.” They wanted a place to highlight new products, how-to’s, and recent press. This tab also defaults as the new visitor landing tab so that first time visitors can get a quick glimpse into what Alterna is all about. 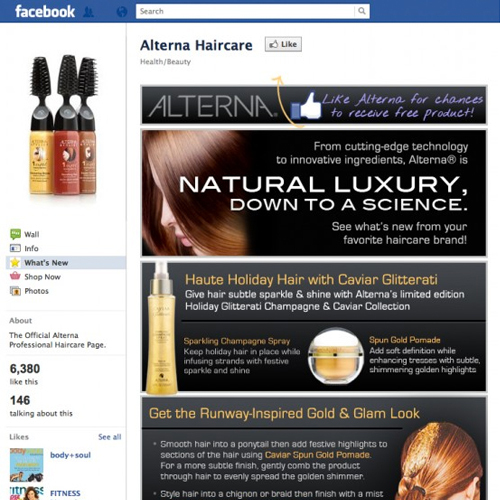 Check it out for yourself here, and become a fan of Alterna!